After Sony hacks, Idahc(lebanese hacker) is back to strike Apple.com . He found two vulnerability on https://consultants.apple.com/ as listed below. 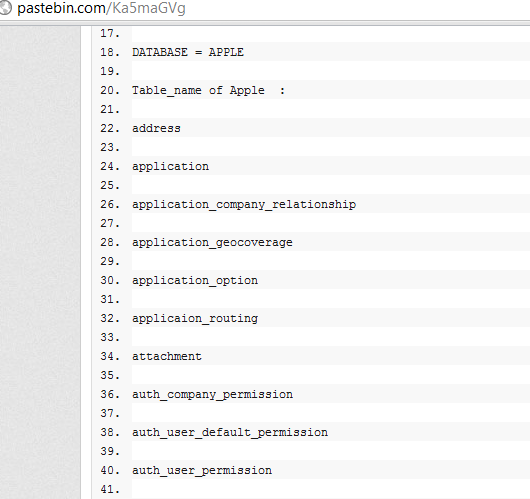 Hacker Expose the Database ,extracted using Blind Sql injection on a pastebin link. According to Hacker "I am Idahc(lebanese hacker) I found a Blind SQLI and Iframe Injection on AppleI am not one of Anonymous or Lulzsecand I am against The ANTISEC OPERATIONBUt this is a poc with not confidential informationI didn't dump users,emails,passwords........".